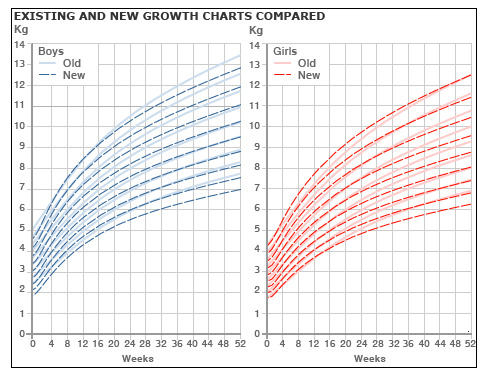 Growth charts in the UK have not been updated since 1990 and were originally created based on the physical development of formula fed babies. New guidelines are being introduced that reflect the slower growth rates of breastfed babies. Using the new growth charts, more children will be classified as overweight. Breastfeeding is the best form of nutrition for infants. The new charts will not only provide more accurate measurements for infant growth of breastfed babies, but will also help healthcare professionals and parents to identify early signs of overweight or obesity and provide support. Data from the World Health Organization’s 15-year study of 8,500 children from six countries was used to create the new growth charts. It is expected that the number of babies classified as overweight will double to 6% as a result of the new growth charts. The new charts are also expected to lessen the number of breastfed children that are classified for “failure to thrive” and given supplemental formula as a result. England has a low rate of breastfeeding beyond six months. Eight out of ten mothers begin breastfeeding, a higher rate than in the US, but only 22% of mothers continue until their children are six months of age. Very few British mothers make it to the recommended age of one year for supplemental breastfeeding. Can’t say I’m too thrilled about calling babies overweight or obese, despite knowing one who no doubt fit into that category. As I understand it, many overweight babies slim down nicely later on. Time enough to worry about weight later. Then again, it’s good that they will be better able to recognize that breastfed babies aren’t necessarily failing to thrive just because they gain a little less weight.